We have talked about how this came about and the why it is done. Now let’s talk about how I do it and what I am actually storing down there. Now let’s talk about the how and what of things. First a couple of pro tips. · The Sun, that brilliant nuclear furnace in the sky, is a stone cold beer killer. Less light is always better. No light is best. 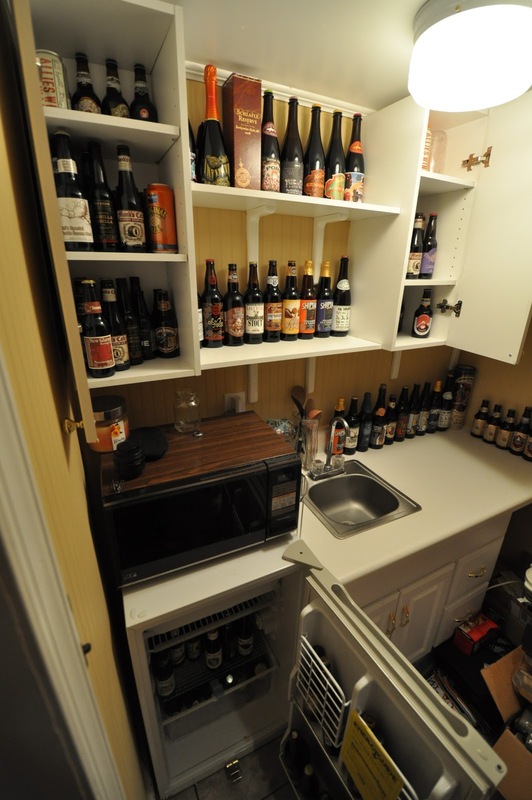 · Unlike wine, store the beer upright. 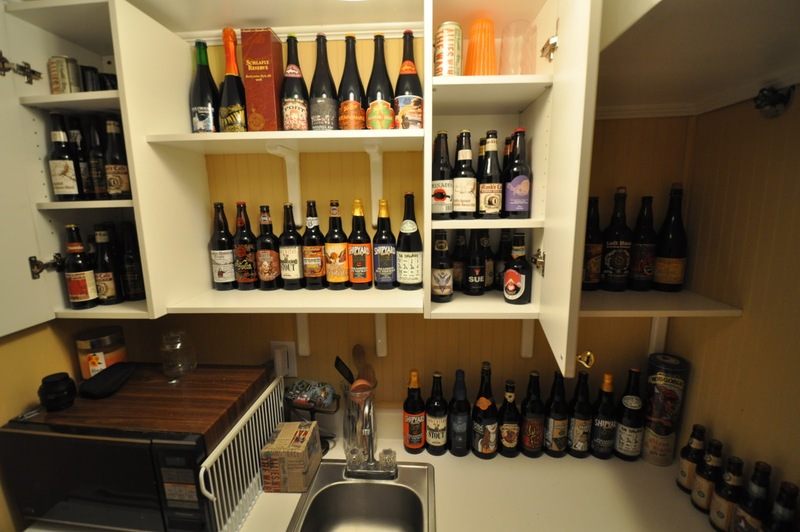 · Remember the rule of two, one for now, one for the cellar, it allows for a point of comparison. · Remember to drink it! Beer does have an “expiration date,” and this stuff is meant to be enjoyed. 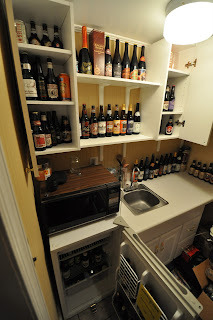 My beer cellar is in my actual cellar, though basement is the kinder word. When we got our present house we discovered that half of our basement is furnished, sort of an underground in-law suite. Two rooms, a kitchenette, and a small bathroom make up the space with concrete foundation walls that are incredibly thick. Those walls help create and maintain a cool temperature year round with little deviation even in high summer or the dead of winter. This is a boon for two reasons. It is perfect for homebrewing ales and it keeps the stocks at a constant temperature. In the far back corner is the kitchenette. There are no windows to the outside (being entirely underground) and it has shelving, cupboards, and a mini-fridge, This is the coolest and most temperature consistent room in the entire house. When everything is closed up it is cool, dry, and most importantly dark. In other words, perfect to cellar beer and ale. top right shelf will depart too. My organization for the beer is still getting figured out, It is sort of hodgepodge right now. At present the beer that is found on the shelves are usually the big hearty ones that will age gracefully. These are all bombers or bigger bottles. In the cupboards are smaller bottles, some for aging, others stashed there until space opens up in the mini-fridge. is actually behind me and too the right. Note the mini fridge at bottom. The refrigerator is secondary storage to the main fridge upstairs. This is where excess ends up until the residents in the small section I have for beer in the main fridge get consumed. These fellas tend to be drunk in a matter of weeks at most a month or two. Beer biding time in the either fridge are things I am interested in right now or don’t have the fortitude for long storage. There you have it, my cellaring narrative. So are you cellaring? What beer or ales have you had success with? Any best practices that have worked well for you? As always, let us know in the comments! I've solved most of my cellaring problems by keeping my stuff in my Dad's basement. He lives about 2.5 hours away, so there's no temptation to drink them. 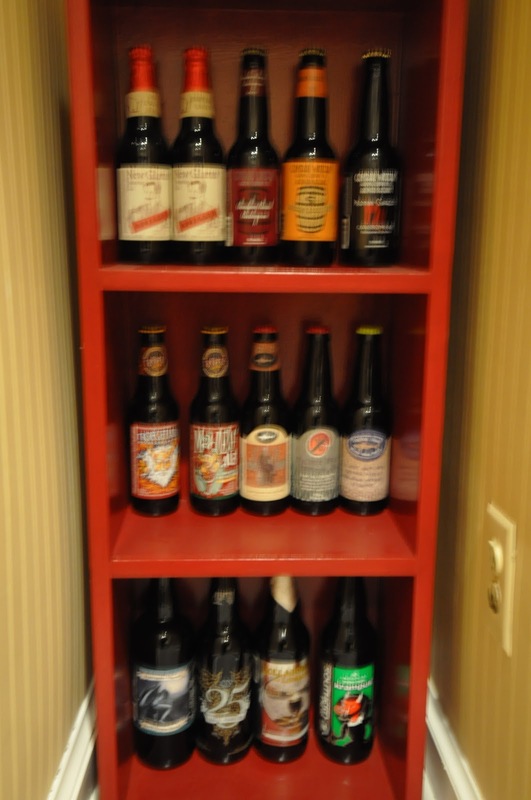 In fact, I'm not even sure exactly what I have, which is funny since my modest collection is probably less than 10 bottles, especially because I made a withdrawal around Christmas. It's also convenient because I don't have a basement in my apartment. Dave, thanks for stopping by. This cellaring thing is a dangerous but rewarding road. Dangerous because I do find that it has changed my buying habits a bit, now I'm sort of into "beer speculation." If I can't drink it know well maybe it will set up a well is the rationalization I end up using. Rewarding because some of those really mature well and gets you some good credit with friends. A nice dark closet away from a heat vent works in a pinch.